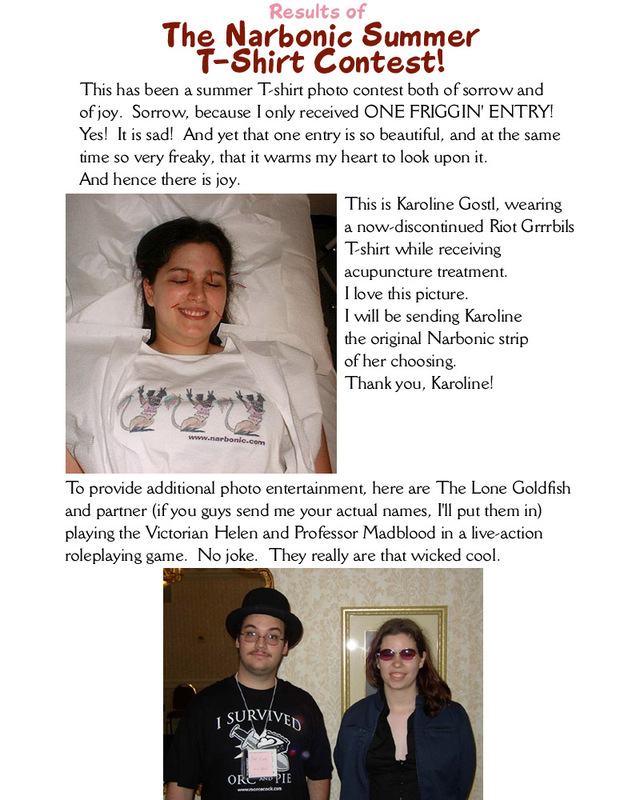 Yeah, slow year for the T-shirt contest, which was a major reason I stopped doing it and started doing the gerbil photo contest instead. Also, I stopped selling T-shirts. I’m planning to offer the evil T-shirts again soon, though! Finally! Karoline is a college friend of mine. She ended up becoming a licensed acupuncturist herself. So watch out, because any random weird thing you do while wearing a Narbonic T-shirt may turn into your career. Every once in a while, someone tells me they LARPed as a Narbonic character. This simultaneously delights and terrifies me. There’s something about the idea of my characters walking the earth doing things without my knowledge or approval. Though, let’s admit it, LARPing as Narbonic characters sounds pretty cool. But which one is The Lone Goldfish? To be willing to selflessly sacrifice other folks’ blood! Their minds some unhealable scars! Shaenon, if enough people read and love your stories, your characters will become real and start doing things without your approval. Artie will end up in the Circle of Ouroboros. Mell will discover that she’s Helen Stone’s secret grand-daughter. And Dave will make Helen a sister ship to the Gay Deceiver which will have a nice name, but everyone will call it the Gerbil Inseminator. There’s something about the idea of my characters walking the earth doing things without my knowledge or approval. That just means they’ve achieved entelechy! Tiff: Surely our heroes will cross father into Wold Newton territories than that. Further yayyy! I too want an Evil t-shirt. And I’m kind of Helen-shaped, so presumably it should suit me. So, since you’re both a licensed acupuncturist and a Narbonic fan, does that mean that you give a discount on acupuncture for talking gerbils? Or a bulk discount on giant gerbils? In all fairness, Shaenon, I did get your permission before using your characters in that game! It was a Toon LARP at GenCon 2002, set as a big Deadlands/general western parody. We needed some funny mad scientists characters and Helen and Lupin were the first two that jumped to mind. You know, the alternative to worrying about Narbonic and Skin Horse characters being used in LARPGs is to create an Official Narbonic LARPG.